← Are underground lunar settlements viable? Three student-built CubeSats were launched into space On April 25th on Soyuz flight VS14 from Europe’s spaceport in Kourou, French Guiana. The CubeSats hitched a lift with the launch of the European Earth monitoring satellite Sentinel -1B. The launch is a part of ESA’s outreach program ‘Fly your Satellite’, set up to encourage education in space technology. They all successfully called home and are currently in low Earth orbit. CubeSat is a term measuring a satellite’s approximate size and mass. A 1-unit cubeSat is a 10-centimeter cube weighing about 1 kilogram. Most launched so far are in the 1- to 3-unit size, but the industry is expanding so rapidly that these early trends may not endure. In the last decade, CubeSats have gone from curious toys to capable tools. Advances in technology have expanded their capabilities in areas as diverse as imaging the Earth, studying space weather and even military interest. They are attracting great interest from scientists and venture capitalists alike. All CubeSats are in low Earth orbit, but NASA announced that it will send a pair of CubeSats on their first interplanetary mission with InSight, its next mission to Mars. The pair of tiny satellites will enter a 3,500 Km orbit of the red planet and provide a communication relay for the Insight orbiter. 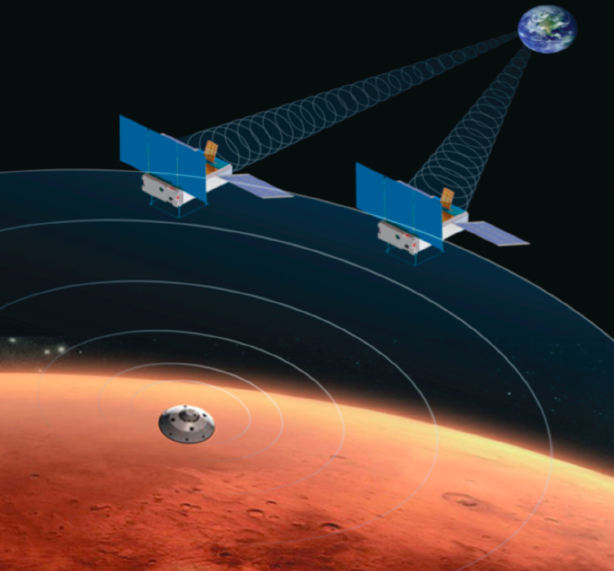 NASA sees this project as a test for CubeSat technology and with the traffic currently orbiting Mars, there will be no shortage of alternative communication paths, should the worst happen to the CubeSat. To date, in excess of 450 CubeSats are known to have been launched, with many more waiting to hitch a ride on a host launcher. There are also probably quite a few which have never been fully documented. Most CubeSats have no on-board propulsion. They are generally obliged to take such launch opportunities as are available to them. They are typically a ‘secondary’ payload and must accept whatever orbit is required for the rocket’s main customer. Having to hitch a ride can mean accepting a launch to an orbit in which their spacecraft will remain for many decades, long after their operational lives of two years or so. Many do not include a de-orbiting strategy. And therein begins the problem. Satellites and debris are monitored by the US Air Force Joint Space Operations Center (JSpOC) and CubeSats in their atomic form—10 centimeters on a side—are near the lower limit of what can easily be tracked. Even larger CubeSats still pose difficulties in obtaining precise positions, resulting in greater uncertainties. JSpOC is the body which provides information to satellite operators to avoid collisions with debris and provides the data to ensure the safety of astronauts aboard the ISS. Several times, the ISS has had to be moved out of the path of debris and on two or three occasions, the astronauts have been ordered to take refuge in the Soyuz spacecraft ‘lifeboat’ for additional protection. No wonder then that there are those in the industry who derisively refer to CubeSats as ‘debris Sats’. The more hardware there is in space, the greater the chance of collisions. To mitigate these risks, CubeSats are supposed to come down within 25 years. However, there is no enforcement of this rule. NASA claimed that by the end of 2014, 1 in 5 of US originating and over a third of all non-US CubeSats are in direct contravention of the 25 year ‘guideline’. Even if everyone complies, operational issues arise to increase the risk of collision. The space station, for instance, will release a lot of CubeSats at the same time. These CubeSats will come off in this cloud, and the JSpOC is trying to track them and add them to their catalog of objects, so that other satellites can avoid them. Based on a prediction that CubeSat launches will exceed 200 per annum and at that volume, some argue that the risk is too great. Because of the much greater uncertainties in the positions of the CubeSats, a simulation found that the collision risk posed by the CubeSats was 30 times greater than for a single satellite. Worryingly, that simulation has already proved accurate in one instance. It predicted CubeSat collisions should have started in the 2013 to 2014 period and, sure enough, the first one happened in May 2013. It resulted in the loss of Ecuador’s first CubeSat, NEE-01 Pegaso. The follow on to accidental collision opens a huge can of worms labelled Space Law. There are few precedents, no laws, multi billions of dollars at stake – perfect, fertile ground for the legal profession. Who can launch want and into what orbit? Should there be enforceable laws? So, it is against this backdrop that a Russian project comes to the fore. As stated in an earlier story; as of January of this year, Roscosmos, the Russian equivalent of NASA became a ‘private’ commercial entity. This was to better enable it to sell more RD-180 rocket engines to the Americans without them seeming to come from the ‘state’ – with which the Americans still have an embargo. If there was any doubt about the switch from communism to commercialism, Roscosmos confirmed a project to be paid for by the Russian ‘crowd funding’ organisation ‘Boomstarter’. The project is called Mayak, meaning Beacon and some 1.7 million roubles has been raised by this novel funding method. What does the crowd want for its money – an orbiting mirror to reflect the Sun as a memorial to the history and tradition of Russian achievements in space! The 16 metre tetrahedron shaped reflector is a possible launch later this year on a Soyuz-2 rocket and will take its place in a low Earth orbit. It will bounce back the sun’s rays to Earth as it orbits, making it brighter than any star in the night sky. So later this year when you look up at the brightest star you can see in the sky, you can say (to paraphrase John McEnroe) ‘You cannot be Sirius’ – Seriously?.